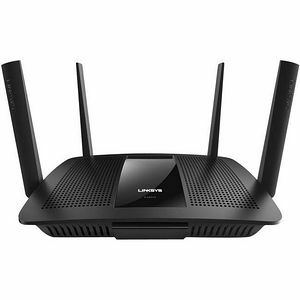 Wi-Fi router features breakthrough MU-MIMO technology to deliver plenty of bandwidth to all of your connected devices such as streaming media players, smart TVs, tablets and more. 1.4 GHZ dual-core central processing unit ensures you always maintain a fast, uninterrupted connection even if multiple users are all connected at the same time. Beamforming technology provides a wide range of coverage that targets Wi-Fi signals to provide increased signal strength and coverage for each mobile device. With the Linksys Smart Wi-Fi App, you can closely monitor and manage your Wi-Fi remotely using a smartphone or tablet by giving you control of guest access, parental controls and device prioritization. USB 3.0 port allows you to quickly share files and add an external storage across your network. Plus, set the four adjustable antennas to ensure optimal coverage and maximum signal strength throughout your entire office.